I’m on a journey and part of it is trying to develop a habit of getting into spiritual materials every day. Some times I have done well, other times I have sucked, but I am trying to do one thing of keep it small and just be consistent. Where it does not require a lot of effort & little or no will power. A couple years ago I took up Obstacle Course Races. It was the first time in my life that I consistently ran for any real training & cut 13 minutes off my second Warrior Dash time … in less than six months between them. It was just starting slow, one day at a time, doing just a little bit. 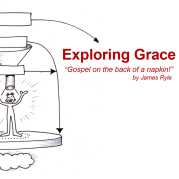 Instead of a bible reading plan from YouVersion/Bible.com – I was reminded of a lesson James Ryle taught about life, Grace & God’s will. It’s a series of blog posts, one post per day. For those over really wanting to over achieve, you could blow through all the posts in one setting … but the key here is really to have a bit to ponder on for a period of time. The dates work with when I am going to read each post. Feel free to ask me about it. Here are those on a Google Calendar. You should be able to add it & get updates each day. No meetings, no discussion – unless you want it. If you want to be known to be doing this – leave a comment below. This is the third bible study thing that I’ve done with several. It’s always low pressure & respectful of your desires. Either publicaly in the comments, or privatly – let me know if you are joining me. Entrepreneur, Coach, Adviser & Stay At Home Dad. Interests include sailing, photography, music, games, art, and success. Great, always good to travel a path with others. wonderful – it’s an interesting series.